Speech has its own significance of being the most effective mode of human communication and for spreading awareness. A confident orator plays an important role in the society, as a person who has an excellent capacity to educate the community. Self-confidence is a paramount important characteristic of the speaker and it facilitates in conveying the message to the audience in a more reliable way. By following the below mentioned tips, which are highly focused on enhancing your ability of speaking in a viable manner, you would become a confident speaker within a short period of time. First talk to yourself: The speech merely does not contain well organized words and sentences, but it also should contain a vibrant sense of motivating others to follow the words. To be confident, first talk to yourself on an interesting topic. If you talk to your mirror image, it would be more sensible to understand the points when you feel less confident. Have in depth subject knowledge: When you make a speech, you have to consider the topic, its scope and the duration of the speech. To become a confident speaker, arranging the facts in a proper sequence and in-depth subject knowledge guarantee higher accuracy of the speech that also exhibits confidence of the speaker. Avoid being bored: If you exactly stick to the factual things related to the topic it would be really boring. You can use humor where it is possible and you should have a higher level of common sense to understand the audience and make immediate changes. Then you will be a more confident speaker, as you are sure about the accuracy of the subject matter, as well as the interest of the audience would be maintained at an optimal level. 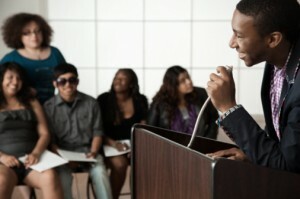 Keep a draft of the speech with you: To be confident that you do not miss or mix-up any facts, you need to keep a draft of your speech; and also it is also advisable to get a print out of your power point presentation or slide show so as to avoid any problems that may arise due to a technical failure. Rehearse well: It is essential to rehearse well as if you are in the real audience to be confident about your performance. The occurrence of mistakes is reduced drastically and your speech would go in a smooth flow. Keep close contact with the audience: Just keep in mind to present the speech with a pleasant smile while maintaining proper eye contacts. Dress well and reflect your distinguish personality to the audience. You can display your confidence by asking questions and responds to them in an admirable manner. A confident speaker has an extraordinary power to touch the subconscious mind of the audience and you can become a confident speaker by simply following the above listed tips.